Put the graham crackers into a food processor and pulse until the crackers break down to the consistency of sand. Transfer to a large bowl. Stir in the salt and melted butter and mix until the butter has thoroughly incorporated; it should be the consistency of wet sand. Press and pack the wet graham mixture into pie plate. Bake for 15-18 minutes. Placing the chopped chocolate in a large bowl. Bring the heavy cream to a boil in a saucepan then pour it over the chopped chocolate and let it sit for 1 minute. Whisk together the chocolate and heavy cream until it's thoroughly incorporated and smooth. Gently whisk in the egg and a pinch of salt until combined then pour the mixture into the prepared pie crust (it will be about half full). Cover the exposed crust with a pie shield or foil. Bake the pie for 20 to 25 minutes, just until the chocolate is mostly set but slightly jiggly in the center. Cool the pie for an hour. Make the marshmallow topping by adding ¼ cup cold water to the bowl of a heat-proof stand mixer fitted with the paddle attachment. Sprinkle the gelatin over the water and let it stand until firm, about 1 minute. Stir together the sugar, corn syrup, a pinch of salt, and remaining ¼ cup water in a heavy saucepan and bring it to a boil over moderate heat, stirring until the sugar is dissolved. Boil it until a candy thermometer registers 260ºF, about 6 minutes. Begin beating the gelatin mixture on medium speed, then very carefully pour in the hot sugar syrup in a slow stream. Try your best to avoid the paddle and the sides of the bowl. Once all the syrup has been added, continue beating it on medium speed until the mixture has tripled in volume and is thick and glossy, about 5 minutes. 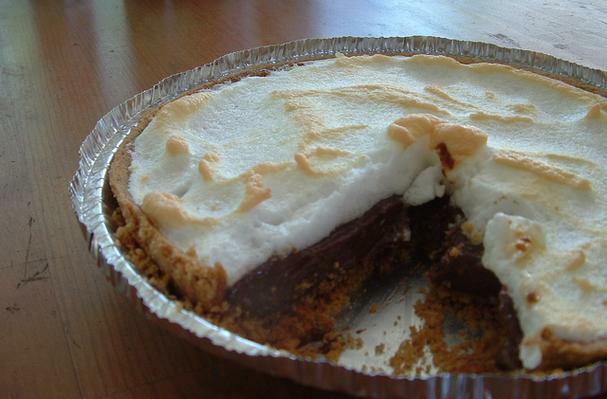 Add the vanilla and beat it just until combined and then immediately pour the marshmallow topping over the pie. It will be loose enough to spread. Refrigerate the pie for one hour, uncovered, then cover it with plastic wrap that has been coated lightly in vegetable oil and chill it for 3 more hours. Place the pie on a cookie sheet, remove the plastic wrap and cover the pie edges with a pie shield or foil. Very carefully rotate the pie under the burner, about 3 to 4 inches away from the flame, just until the top is evenly browned, about 3 minutes. You can also use a blow torch. Let the pie cool for 10 minutes before slicing it with a sharp knife dipped in hot water. This looks delicious! If I wanted to use premade graham cracker crumbs, how many cups would I need?